Networking events are not just about repeating introductions five thousand times until you find someone that interests you and your business and then throwing your elevator pitch at them. Those jackpot contacts at networking events come in all job titles and industries because each person has their own professional network and if someone likes you, a referral from them can be gold. So do not write anyone off. You want everyone there to see your brand. However, most importantly, networking is about people and if you treat people well, hopefully they will treat you well. Do not just throw your brand in people’s faces. Find a balance between selling yourself and your business and listening to others with genuine interest even when you do not think they will benefit you or your business in any way. 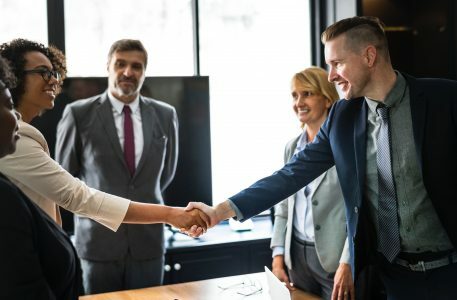 Each person could be a new customer, a new supplier, someone who could connect you to a new customer or supplier, or maybe someone who could become a mentor or just a friend. Welcome any and all professional connections to emerge and treat everyone like a person, not just someone who could write you a check. Remember, there are plenty of ways to put your brand in front of people without being too much of a salesperson. Business cards If you show up to a networking event without business cards, people may remember your first name or they may vaguely remember your business but visuals are powerful. You want your card with your name, business and logo in front of them. Not to mention, if someone asks for your contact info. and you do not have your card, do you want your brand to be a jotted down note? When you meet someone that you just might want to stay in touch with, make sure you always have a business card to give them and try to get one from them. Even if they have no interest in contacting you, chances are they will glance at the card and see your logo and if your business comes up in a conversation they have with someone outside of the event or if someone asks about a service you provide, they might dig it out of their stack of cards and give it to a great contact. Let your business emerge organically in conversation Have you ever walked into a department store and had a salesperson walk up and spray perfume on you against your will? That is how it feels to have a person jump in front of you and start pitching their business. Do not let that be the approach to educating people about your business or your brand will be the perfume sprayer everyone dodges. When you meet someone, be authentic. Be a real human being. Start a conversation. Get to know people. What do they do? What are they passionate about? What are they looking for at this event? Let them ask about your business or bring it up when they mention something related to your business or industry. You are a big part of your brand and when people like you, they are more inclined to like your brand. You are passionate about your business so the topic should come up naturally. Look for a need While you are being authentic and trying to learn about other people, you are also looking for a need that your business can satisfy. Are you a web designer? A lot of businesses have in-house web designers or work with freelancers. When you talk to people, ask them about their business. You can even gently steer the conversation in the direction of asking them about their web page and say you like to learn how and where businesses approach their web design needs. If you see they might actually need your services, great. Pitch away. In probing their needs, if you see they have all of their needs met, tell them a bit of what you do and move on to the next topic or next person. Maybe they do not need your services but they might in the future or they might meet someone else at the event that needs your services and, if you were effective at building some rapport, maybe they will direct someone to you. Can you sponsor the event in any way? Networking events come with advertisements, newsletters, banners, posters, etc. If you have the cash or a service to be offered to help the event coordinators and this is the kind of event that could really be valuable brand exposure for your business, offer it up. Get your logo put on the marketing material. When you speak to someone at the event and you and your business card are the second or third time they have been exposed to your brand, there is a better chance they will remember you. Also, when your business is at a stage that it is sponsoring events that these folks deem valuable enough to show up at, that in and of itself gives your brand some added value. Can you speak at the event? Networking events often have a theme and speakers. Are they asking for speakers at the event? What better exposure can you possibly get than standing up in front of everyone and introducing yourself and your business and showing people what you know? That is the kind of thing that sparks people’s interest and causes them to approach you. It is also a great ice breaker as people are not coming up to you as just some other random person in the room. They have already heard from you and your business and what you talked about will likely be the beginning of the conversation. Follow up and give a call to action You can easily walk away from some networking events with anywhere from ten to thirty business cards. After you meet someone, make a little note on their business card so you remember who they are and then, after the event, pick the ones that you thought could be valuable contacts and follow up with them. Adding something unique to your conversation with them is also helpful so it is obvious that you are following up specifically with that individual and not just copying and pasting a general message to a bunch of people. Lastly, end the e-mail with an invite to coffee (and give a reason for the meeting), ask them to check out your services on your web page, ask for advice, or request they put you in contact with someone they mentioned during your conversation that could be valuable to your business. This gives the person an action to perform. Though there is no guarantee they will do it, they are much more likely to do it if you ask them. As you are part of your brand, simply following up will help people to remember you but also sending that e-mail with your logo and the URL to your web page along with contact information also means you are able to put your brand in front of that person just one more time. If this is a valuable contact, why not? Even if they do not reply, you were able to engage with them again and get them to think about you and your brand outside of the networking event. Networking events can be fun and energizing or tiring depending on your personality but they can be really great for your brand if you approach them properly. Before you go to a networking event, strategize a bit. Go over the checklist. Do you have your business cards? What needs can your business address? How can you weave your business and brand into conversation in a natural way? Other than showing up and networking, what other opportunities are out there to put you and your brand in front of people at and before the event? And then, most of all, just remember that you are there to meet people and treat them well and let that be your personal contribution to your brand image.